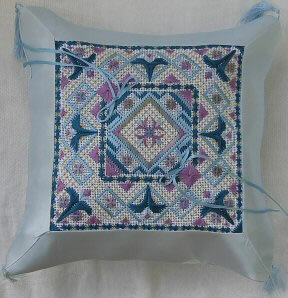 This dramatic design in shades of ocean blue and lavender is deceptively easy and quick to stitch. This was designed for Carrie and Brock on their wedding day and framed as a tray but has endless possibilities for finishing and of course endless possibilities for gift giving. Waterlilies, Neon Rays, DMC and gold metallics are used to create Bargello waves, Tied Windmills, Amadeus, Eyelets and more. Approximate finished size of the design is 8” x 13”. Approximate size of the finished design is 6.5” x 6.5”. A beautiful wedding or anniversary gift for that special couple or a special gift for yourself! Neon Rays, Perle Cotton, Waterlilies, Metallic, and floss combine in shades of mauve and green to create a delightful tray that is not only beautiful, but useful as well. 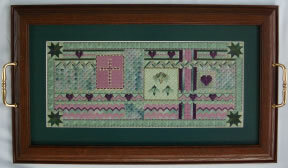 Stitches include Amadeus, Herringbone Couching, Hungarian, Diagonal Mosaic, Rhodes Hearts, and many more. Approximate size of the finished design is 14” x 6 ½”. 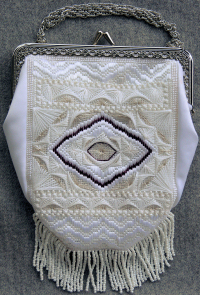 This is a lovely bride’s purse that is also suitable for bridal attendants, proms, or an evening out on the town. Shades of white in Perle Cotton, Patina, Neon Rays create this stunning little purse. Needlepoint Silk in wine red, metallic thread, and Mill Hill Seed Beads add the accent, or change to match the colors in the wedding. Stitches include Rhodes, Bargello, Crescents and Eyelets. Uses handbag handle available from Bag Lady Press. Be sure to check out the matching Ring Pillow! Approximate finished size of the purse is 4.5” x 6.5”. 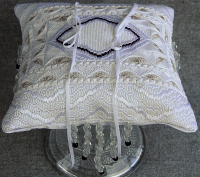 This beautiful little ring pillow that matches the Victorian Bride’s Purse is stitched in shades of white in Perle Cotton, Patina, and Neon Rays. Needlepoint Silk in wine red, metallic thread, and Mill Hill Seed Beads add the accent, or change the colors to match the wedding. 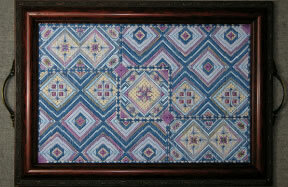 Stitches include Rhodes, Bargello, Crescents and Eyelets. Approximate finished size of the Ring Pillow is 7” x 7”.